When Daniel Alemán walked free after spending over a year behind bars on trumped-up extortion charges in El Salvador, his family handed him a soccer ball. He had an unfinished game waiting for him from the day police plucked him from his favorite pastime near his home in territory controlled by a faction of the Barrio 18 street gang. But for his safety, the 23-year-old never returned home. Now, his family wants to get him out of the country. Alemán lived with his family in Altavista, a sprawling neighborhood stretched across three municipalities on the outskirts of San Salvador. Dominated by a faction of the Barrio 18 street gang, the 18 Sureños, Altavista is one of the largest residential districts in Central America, home to more than 100,000 residents. Long, narrow alleyways jammed with houses, inaccessible by car, occupy large swathes of the neighborhood. A police official from the Ilopango municipality, which includes a section of Altavista, describes the area as notoriously difficult to police. In January 2017, police detained, beat and planted marijuana on Alemán. The drug case was thrown out a month later, but authorities slapped him with a fresh charge of aggravated extortion, lumping his case together with five others accused of the same crime. Alemán spent one year and five months in jail before a judge ruled in June that he was innocent. Prosecutors appealed his acquittal. 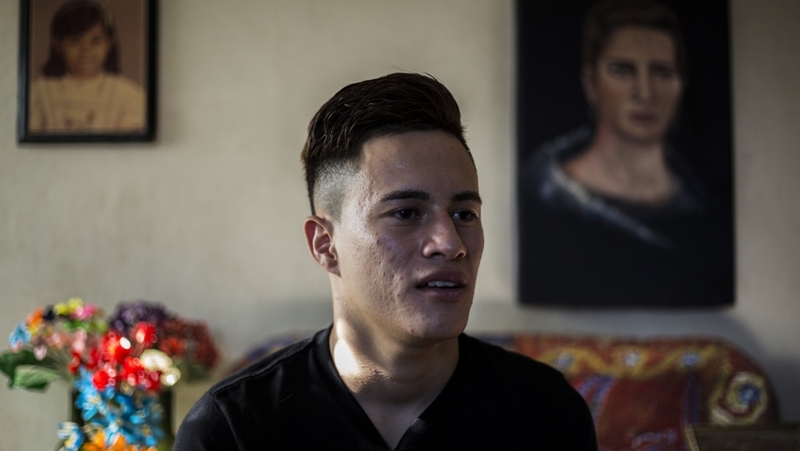 At a hotel in central San Salvador, miles away from both his family’s neighborhood and the location he now lives to avoid security concerns, Alemán explains that although he is relieved to be free, life is far from normal. Now, he finds himself sweating over small decisions like whether or not to leave the house. Alemán’s experience has become emblematic of the notion that in El Salvador, being a young man can be a crime, a phrase often repeated by human rights campaigners in the small Central American country that is notorious for lawless violence. Never involved in a gang, Alemán is one of the innocent youth swept up alongside gang members in the government’s “iron fist” crackdown on violent crime. Though popular among voters, the mano dura policy has failed to curb gangs’ reining role in the soaring murder rate. Homicides have declined after spiking in 2015 to levels not seen since the civil war, but El Salvador remains one of the most violent countries in the world. Meanwhile, Salvadoran police forces have been accused of a slew of abuses in recent years, including extrajudicial killings. Though less extreme, cases like Alemán’s show how the social pressure to deliver results in a war on gangs make security forces more likely to double down on victims than admit mistakes. For Alemán’s lawyer, Dennis Muñoz, the case is significant because it forced authorities to own up to such errors. “It is a legal precedent and a social precedent. It has become emblematic,” Muñoz says of Alemán’s case. “I think families can take courage — lose some fear — to be able to report these cases.” Rights groups suggest most victims of police abuses never report the crime out of fear of reprisals. When police detained Alemán, they took him to a police station and photographed him with a pound of marijuana, pinning him with charges of drug possession with intentions to traffic. The marijuana was just a prop that never appeared in court, says Alemán. A judge absolved him and nullified the case, finding that police had planted the evidence. Alemán’s situation became more complicated after the drug case scorned police. In February 2017, he faced a new charge of aggravated extortion, which is punishable by 10 to 20 years in jail. Prosecutors accused Alemán of collaborating in a criminal network to pick up an extortion payment of $400 in a shopping mall. Four were charged in the case, while Alemán and another defendant were acquitted. Muñoz suspects that putting Alemán in an extortion case with other alleged criminals was a strategy to attempt to compensate for dubious evidence. “It is clear that this is revenge against Daniel,” says Muñoz. “It’s a vendetta.” Out of dozens of young men at the soccer field that day — including some gang members, according to Alemán — the officers only detained him. Muñoz says police targeted Alemán after an earlier altercation in which Alemán’s mother, Meira, stood up to police for roughing up her son. Almost immediately after he was detained, Alemán’s mother and sister began speaking out about the case. “Too bad for them they came up against people who were going to put up a fight,” Alemán’s mother, Meira, jests. A movement quickly coalesced, drawing attention from established human rights defenders as well as families of other arbitrary detention victims. “In addition to denouncing the irregularities in the case of my brother, it was also about opening a space so that [families of victims] could speak,” says Alemán’s sister, Tatiana, a journalist at a local newspaper who covers entertainment and health. She took charge of publicizing Alemán’s case — including, at one point, by sending 25 tweets per day to the head of the police and the prosecutor’s office — and Meira spearheaded connecting with other impacted families. It is unclear how widespread cases like Alemán’s are in El Salvador. Arbitrary detentions are difficult to track, but experts on police abuses claim Alemán’s is not an isolated case. According to the human rights organization Cristosal, the fact that belonging to an “illicit group” is designated as a crime punishable with three to five years in jail in the 2010 criminal code has fueled an increase of police profiling and arbitrarily detaining youth. But relations with police are often tense. She claims it doesn’t matter whether a person is a gang member or not. “The problem is that they are young,” she says. That was the inspiration for the name of the movement for Alemán’s release, Los Siempre Sospechosos de Todo — roughly, “the ones always suspected of everything” — a line borrowed from a poem by Salvadoran poet Roque Dalton. “The youth are always [seen as] suspicious, even for walking wrong,” Meira says. Human rights activist Wendy Morales, who was also falsely accused of extortion, says young men like Alemán are at risk of police abuses just by living in marginalized neighborhoods with rampant gang activity. “There’s an incredible level of stigmatization and criminalization,” says Morales, general manager of the youth-led social justice organization Azul Originario (AZO), adding that authorities are keen to boost numbers showing results in the war on gangs. 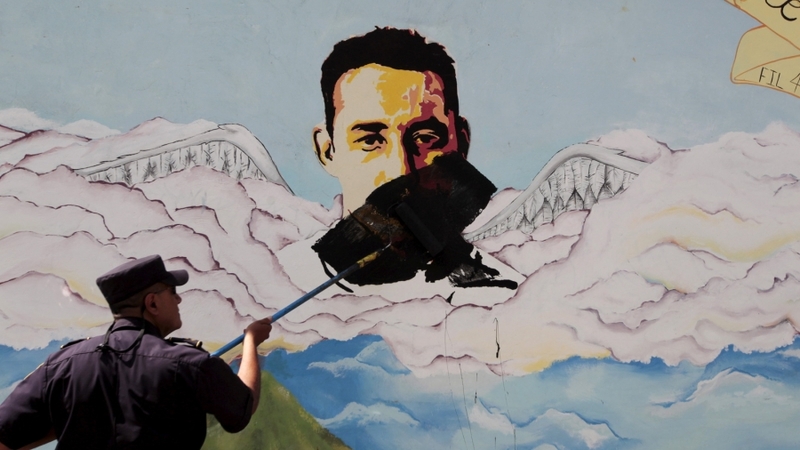 Heavy-handed security measures to crack down on gangs and violent crime have been in vogue for the past 15 years in El Salvador under both right- and left-wing governments. But the policy has taken a particularly deadly turn in recent years under the current President Salvador Sánchez Cerén of the FMLN party, leading to “a pattern of behavior among security personnel amounting to extrajudicial executions and excessive use of force,” according to a June 2018 UN report. The former administration secretly facilitated a gang truce that dropped the homicide rate to a 10-year low, but the current administration refuses to negotiate with criminal organizations. Instead, they weaponized a decade-old anti-terrorism law in the war on gangs. The redoubled offensive against gangs has given “implicit permission” to security forces to use lethal force without fear of consequences, creating a “cycle of revenge” between police and gangs, says Reyna of SSPAS. Killings of alleged gang members in so-called armed confrontations jumped from 103 in 2014 to 591 in 2016, while police and military fatalities totaled seven in 2014 and 10 in 2016, according to official statistics. The disproportionate death toll raises alarm over potential extrajudicial executions. Indeed, witnesses report security personnel often kill suspected gang members “execution-style” in these clashes before planting weapons or drugs or otherwise tampering with the scene, according to the UN report. Investigations into police abuses are infrequent and shallow, which rights groups say creates a “de facto impunity” that could allow police death squads to flourish. Alemán now joins the ranks of tens of thousands of internally displaced people in El Salvador, forced to move miles from his home in Altavista out of fear of further police violence. Human rights groups report police abuses increasingly drive forced displacement, which often leads to migration. Meanwhile, the two police officers who planted marijuana on Alemán are set to go to trial a second time for a crime known as procedural fraud. A judge initially ruled they were justified in falsifying the evidence since they used it to bring in an alleged gang member. In a country with high levels of impunity across the board, police accountability is rare. Alemán’s case lays bare how a police force and judicial system bent on flexing their muscles against the deep-rooted gang problem produces retaliatory abuses, especially against young men from poor neighborhoods, not to mention the state’s incapacity to protect victims. His sister, Tatiana, wants to build on the momentum. “Although my brother is free, this must continue,” she says. “For other people, this also gives hope that we can beat the system from within.” She plans to create a group to offer support and legal assistance to families of prisoners, regardless of whether they are gang members or not — an unpopular opinion in El Salvador. He outlines humble goals: establishing himself wherever he ends up, running a small business and giving back to his family and others who have supported him. He’s sure about one thing: he sees his future far from San Salvador.